Lighting a Fire: Finally back! I am finally back home and settled after the conference. I thought I would have time for posting but I was exhausted! Frankly, I still am exhausted! I thought I was tired after a day with the kiddos- but this was a new/different type of tired. I heard some amazing presenters including the delightful Rafe Esquith. 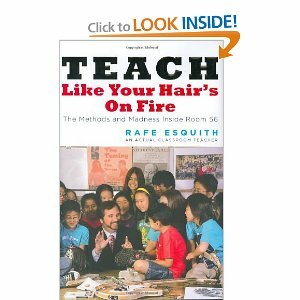 If you haven't read Teach Like Your Hair's On Fire (I haven't yet either) I would recommend it based on his inspirational presentation! Wow is he dedicated! I read that book during student teaching and it was amazing and so inspirational! It would be amazing to meet him. Glad to hear that you liked it! I picked up the book but haven't read it yet- he has another book coming out soon! I've heard of that book. It sounds like a good read! I'm glad you enjoyed yourself.